In the early hours of this morning, Red Rockette nested on a beach in Colombia called Bobalito, near the community of Necoclí. 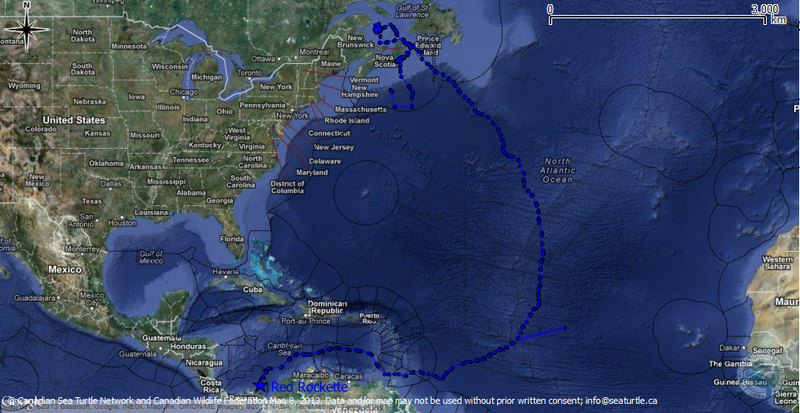 The first of the maps below shows her whole track—all the way from Nova Scotia to Colombia. 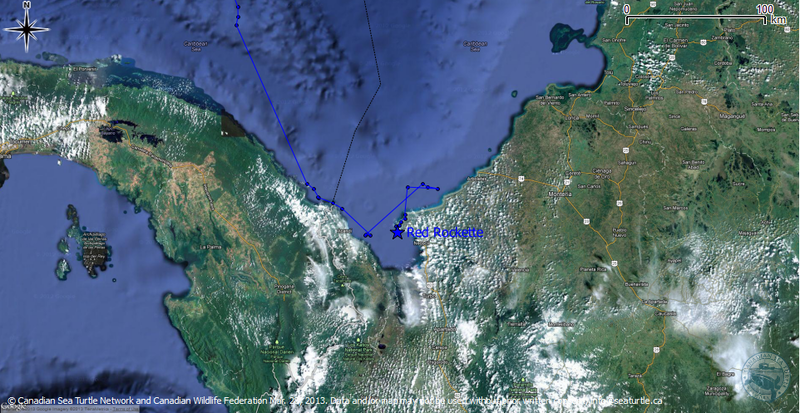 The second is a closer view of her more recent positions in relation to the Colombian coast. The third—my favourite—shows her movements between 8:49 p.m. COT (Colombia time, which is 10:49 p.m. Halifax time) yesterday evening and 8:23 a.m. COT (10:23 a.m. Halifax time) today. This turtle, whose movements are being watched so carefully by so many of us, laid her first nest without encountering a human. And although there is something lovely about imagining her alone carefully carving out that nest in the moonlight, we want someone to find her next time. We want her satellite tag back! Leatherbacks nest several times a season. 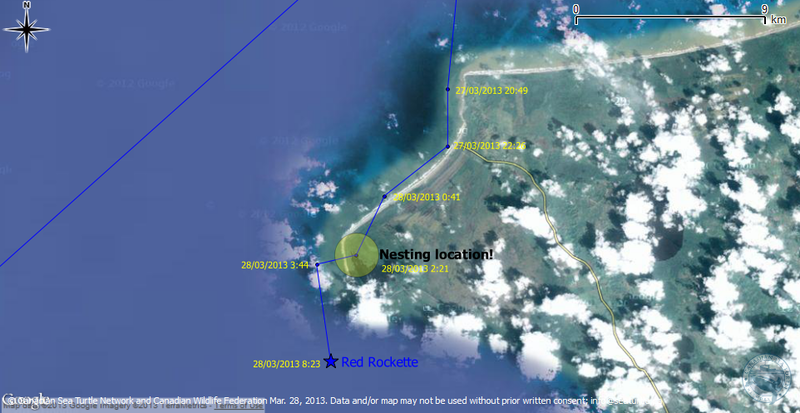 Red Rockette will come back to land to nest again in a week or so. We are lucky to have help from our friends at the Conservación Ambiente Colombia Foundation (CACF). CACF supports a relatively new sea turtle program at Bobalito Beach. Community leaders from the village of El Lechugal—which used to poach almost all of the nesting turtles—launched a conservation program at Bobalito to protect the animals, engaging their community in projects like sea turtle monitoring and environmental education. Thanks to our colleagues at CACF, the community had already begun patrolling Bobalito in anticipation of Red Rockette nesting—long hours of walking slowly up and down the many kilometers of beach. However, now that we know Red Rockette has nested on Bobalito once already, even more community members will begin patrolling the beach to increase our chance of finding the turtle next time. It is difficult to communicate with Bobalito—there is minimal cell coverage and Internet access. But CACF is working hard on our behalf to establish a communication chain that will allow our updates of Red Rockette’s positions to reach the community quickly. 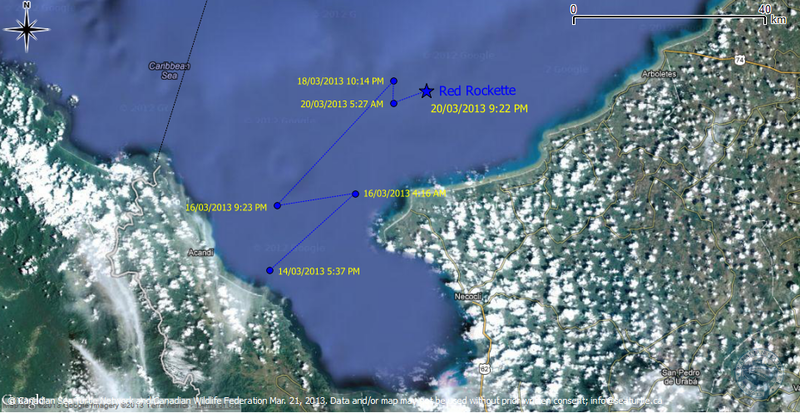 Now we have to hope for a couple of things: We have to hope that Red Rockette’s satellite tag keeps transmitting and we have to hope that she chooses to nest on Bobalito again. If she moves even a little to the east near the community of Mulatos the odds of finding her aren’t as good. The beach at Mulatos is very long and the sea turtle program there is only just beginning. This is the part where we feel like kids waiting for a birthday. When will the turtles nest? Today? Tomorrow? Three weeks from now? Our team is on alert, counting the days and hours between satellite uploads, texting and calling each other late into the night when the data comes in. And all the while, Red Rockette is behaving in classic leatherback fashion, swimming around the nesting area, probably mating. To be honest, it’s a bit frustrating. There she is, super close to the beach on March 14. Then, she bounces out of the Gulf of Uraba a little on the morning of the 16th. We wonder all that day if she’s heading somewhere else, when she swims back closer to shore again that evening. We wait. Our colleagues on the nesting beaches—with whom we are in constant email contact—are prepared for her possible arrival. Then when we hear from her again on March 18, she’s off again, away from the beach. “This is completely normal behaviour,” says leatherback scientist Dr. Mike James. Normal. And frustrating. And exciting. Because in this world, where we have instant access to so many answers, there is something marvelous about being held in complete suspense. Here are recent positions for Inspire and Red Rockette. They are hovering just offshore. 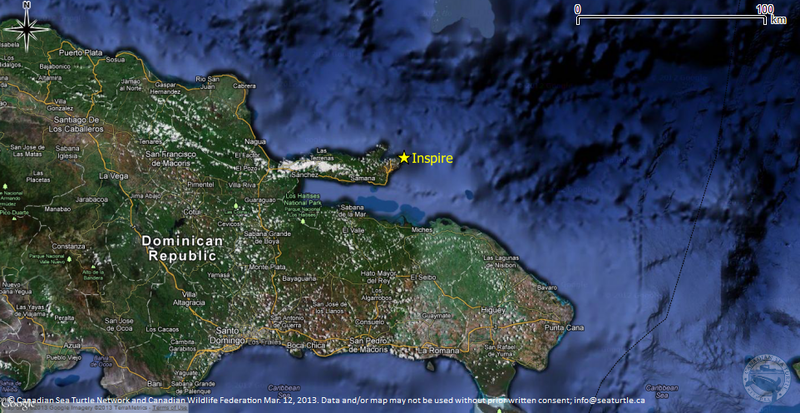 The first two maps show Inspire’s position off Dominican Republic. The second two show Red Rockette, who seems to be heading for Colombia. Another possible nester: Red Rockette! Another one of our leatherbacks is closing in on a nesting beach! 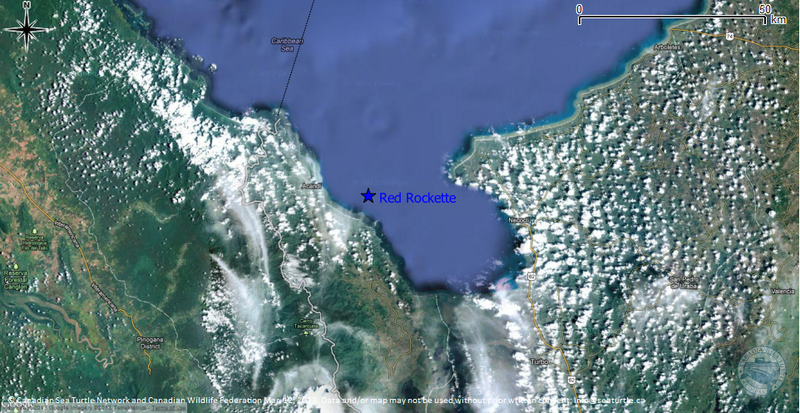 Red Rockette is just off the coast of the Panama—Colombia border. She does not have a recorded nesting history, so it is too early to call where she will end up. There are five beaches in contention right now: Armila in Panama; and Acandí, Capitancito, Playeta, and Playona in Colombia. We have had a Canadian turtle found at Playona in Colombia before with the help of local people working there from Grupo GILA. That turtle was wearing a satellite transmitter, which they got back for us! We’ve got our fingers crossed that the same thing will happen with Red Rockette. These beaches are in remote areas of these countries, some accessible just by boat and others without easy access to Internet or phones. We want to make sure that the local environmental groups and local community members know to look for our leatherback on the beach. Again, the international sea turtle community is swinging into gear: scientists, environmental groups, government biologists, and local people in areas near the nesting beaches are all helping out. I can’t say enough good things about how helpful sea turtle people are. 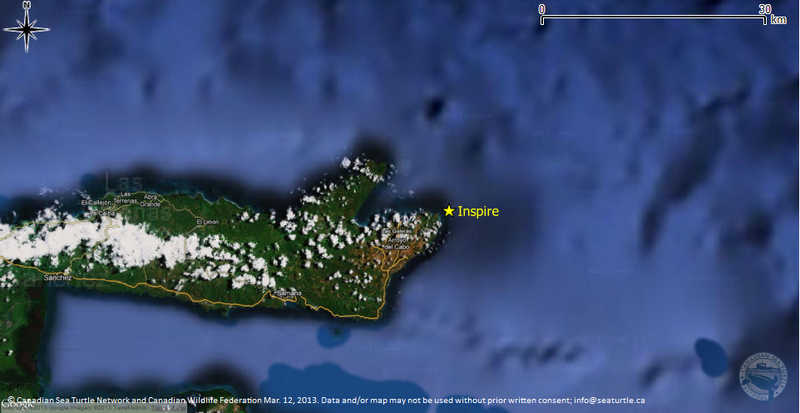 Here is Inspire‘s track. 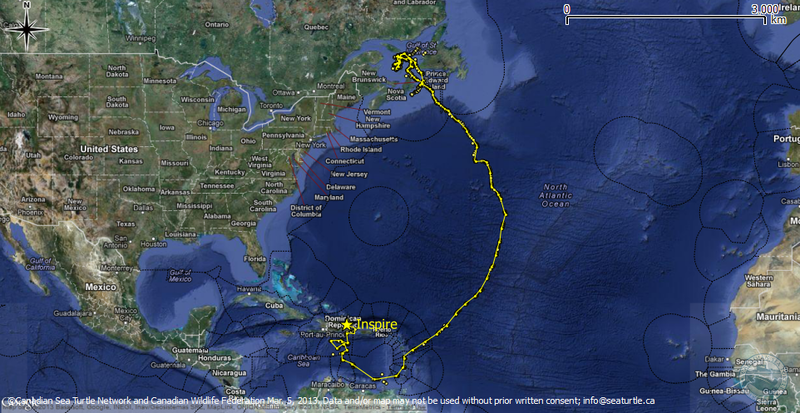 The first map shows her whole trek from Canadian waters down to the nesting area. 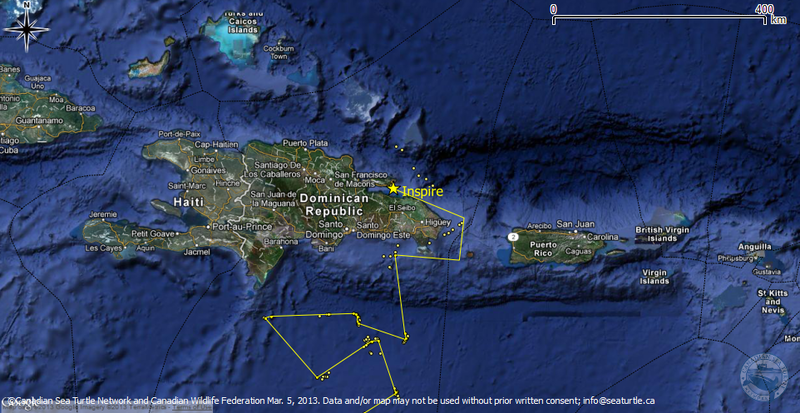 The second and third maps zoom in on her track off Dominican Republic. We were up late last night. 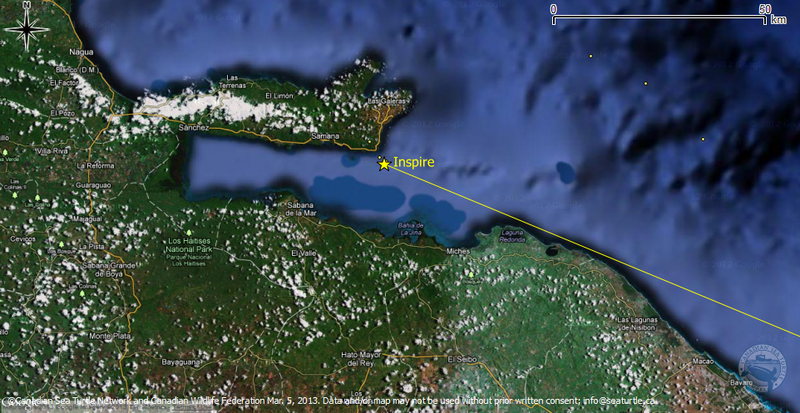 Inspire is within a few kilometers of land, deep in Bahia de Samana, a bay on the northeast side of Dominican Republic. Maybe, just maybe, she’s heading in to nest. We have not had a Canadian turtle nest in Dominican Republic before. The sea turtle community is incredibly supportive and helpful. 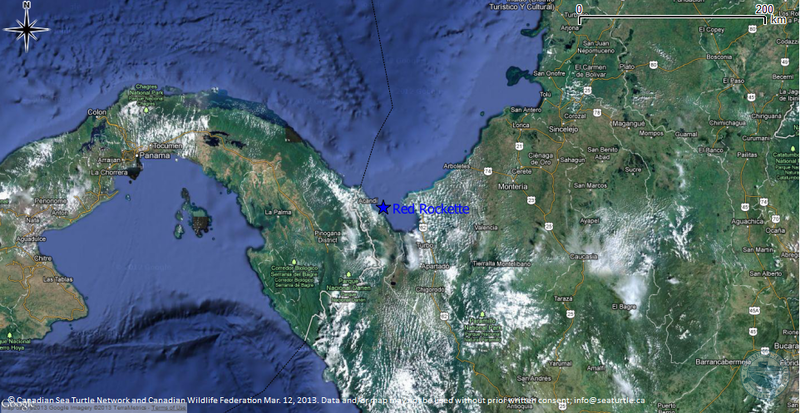 So, we contacted our friend and colleague Carlos Diez, who is the country coordinator for the Wider Caribbean Sea Turtle Conservation Network (WIDECAST) in Puerto Rico, which is near Dominican Republic. Carlos put us in contact with his WIDECAST counterpart in Dominican Republic, Dr. Yolanda León. Yolanda connected us with Peter Sánchez, who directs the marine sanctuary in that area of the country. “We often see leatherbacks on the whale watch trips, which are on-going now. However, most of the nesting activity we’ve recorded there has been on the north of the peninsula. So interesting!” Yolanda wrote. Peter Sanchez and his crew are now on alert. We’ve sent them maps and photographs and are hoping that if Inspire heads onshore, they’ll be able to find her and remove her satellite tag. Dominican Republic is a tricky place for sea turtles. It has high rates of poaching—sea turtles harvested for meat (and hard-shelled turtles for their shells), and sea turtle eggs harvested in large numbers. Peter’s team will be key to helping protect Inspire. We’re holding our breath and checking our computers and will keep you posted.